Who makes lasagna in August?!?! Apparently this girl. And then, who forgets to take a finished picture of it because it smells so dang delicious? Raises hand. Yeah, that would be me as well. 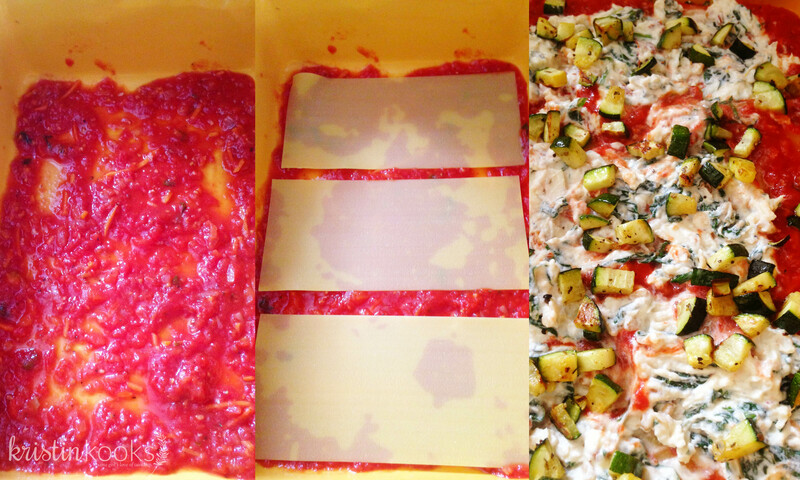 Sadly there are no finished pictures of this lasagna, you will just have to trust me on taste! But, there are a bunch of step-by-step pictures. I wanted something I could make ahead of time, let rest in the fridge, and then simply pop in the oven come dinner time. Filled with spinach, pine nuts, sundried tomatoes, roasted zuchinni and a homemade sauce, the recipe turned out quite tasty. I decided to roast the zucchini which added a little flavor to a somewhat bland veggie. I love zucchini but sometimes it needs a little help in the taste department. 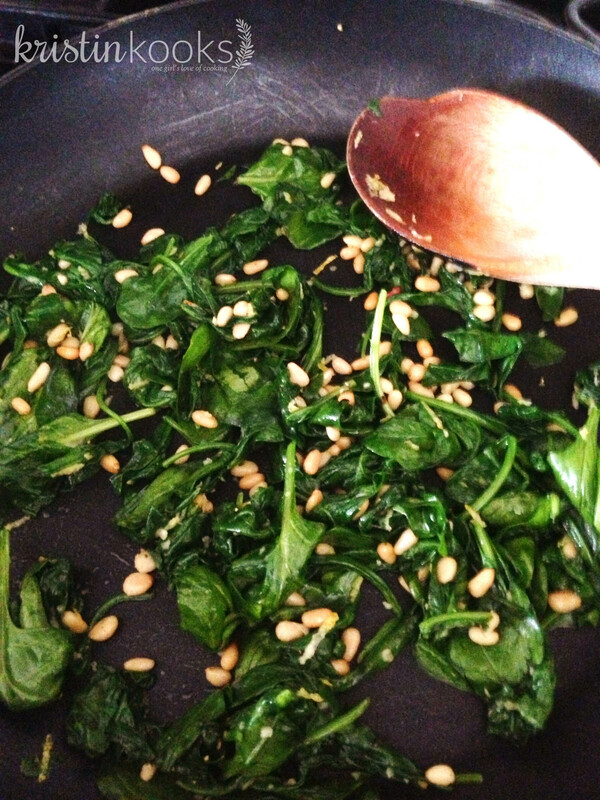 I also sauteed the spinach with garlic, pine nuts and lemon zest to jazz it up a bit. Pine nuts? Good idea. They added a nice little mellow nutty crunch here and there. We topped it all off with a fresh summer salad to keep things kinda light. And for dessert . . . shortcake biscuits with fresh berries and peaches and some homemade whipped cream. Delish. Saute onion with 2 tbsp. olive oil and a a couple turns of the pepper mill. Saute on medium heat for about 5 minutes, stirring occasionally. Once soft, add the shredded carrots and chopped basil and saute for another 4 minutes or so. 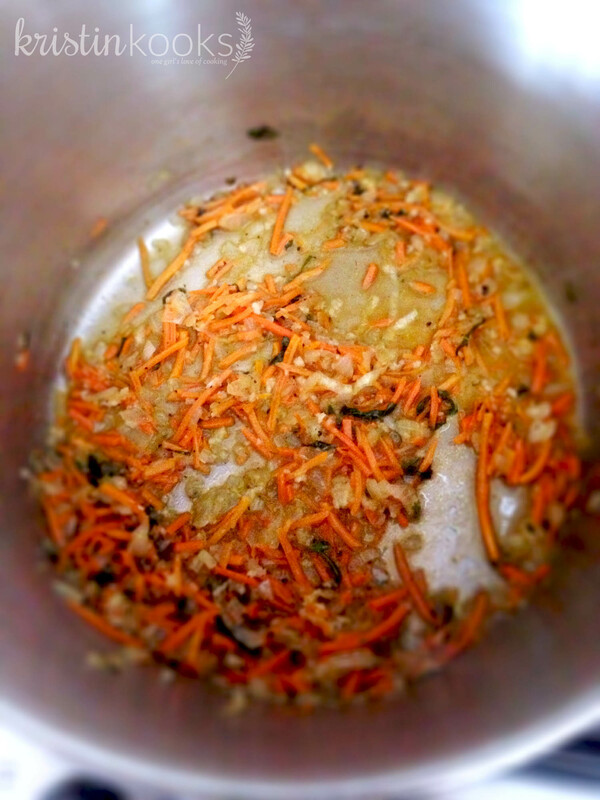 At this point add a decent amount of salt to season the onion and carrot mixture. I read somewhere not to salt your onions in the beginning to allow them to caramelize up a bit. Adding the salt from the beginning draws out a lot of liquid which doesn’t lend itself to the best browning. Next add 6 cloves of garlic (reserve one for the spinach mixture) and saute for about 1 minute. Then add in the veggie stock. Cook everything for a couple minutes until some of the stock begins to evaporate. Once you’ve added the veggie stock, open your cans of tomatoes. 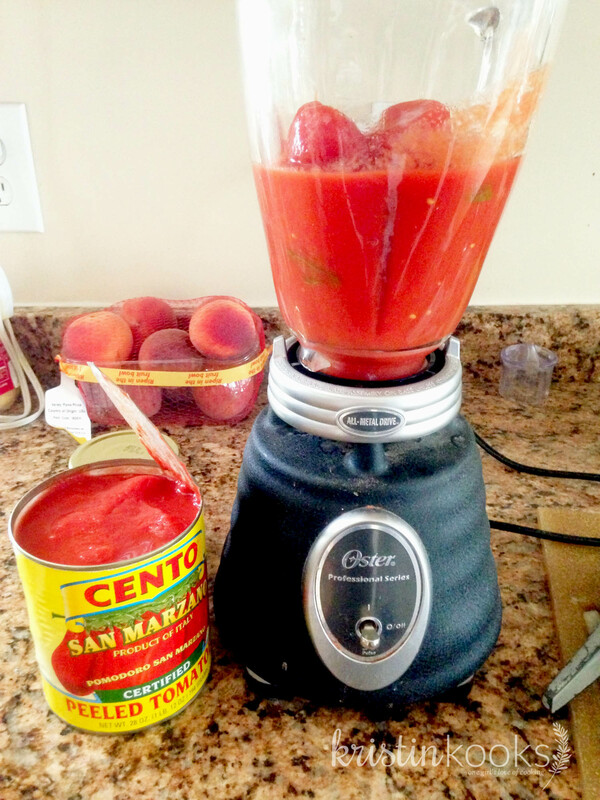 Add one can at a time to your blender or food processor and quickly pulse four times to break up the whole tomatoes while still leaving them a little bit chunky. 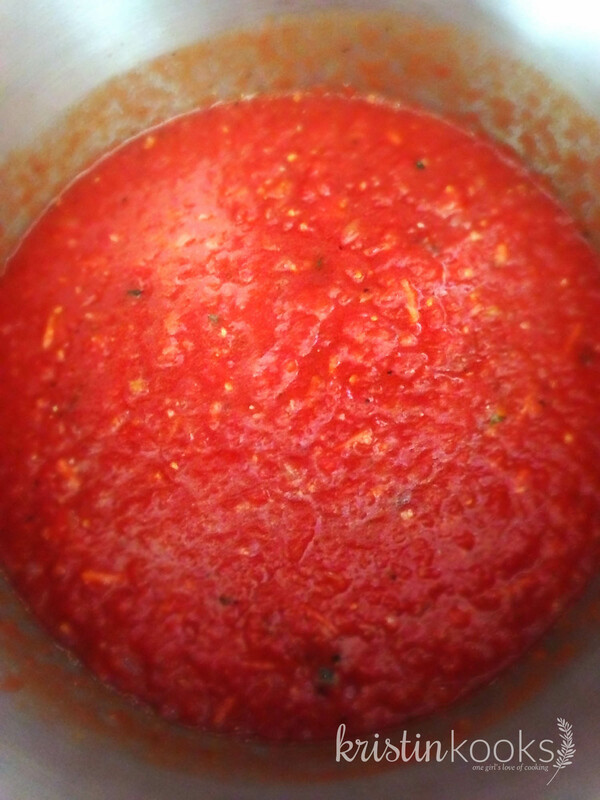 Repeat with the second can of tomatoes and add to your pot. Simmer for 20 minutes on a gentle heat. After 20 minutes, add 1 tsp. brown sugar to cut any acid of the tomatoes. Taste and add any additional salt and pepper to your liking. Turn off heat and let sit til it’s time to layer the lasagna. Preheat your oven to 425 (this can be done while you are working on the sauce). Chop zucchini into bite size pieces and spread on a sheet pan. Season with salt and pepper and the dried oregano. 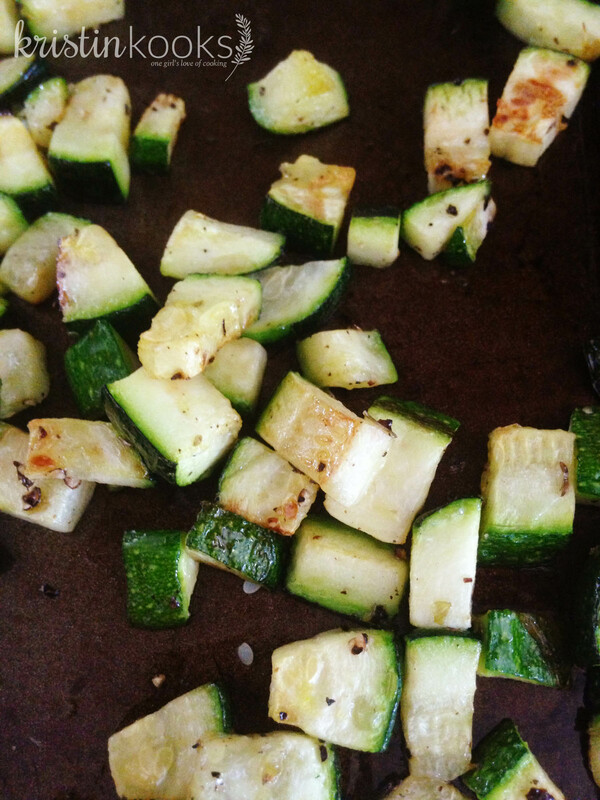 Drizzle 1 tablespoon of olive oil over the zucchini and mix everything together with your hands. Pop in the oven and roast for about 15-20 minutes. You want to see some color on the zucchini, like the picture below. Let cool until ready to assemble. In a large pan, saute one clove of garlic, one tablespoon olive oil and pine nuts for about a minute making sure not to burn the garlic. Add spinach to the pan and some fresh cracked black pepper. Stir occasionally and cook until wilted. Add lemon zest once wilted and saute a tiny bit longer just to incorporate everything. Whew. I know that seemed like a lot and this recipe kind of goes against my whole “if a recipe has too many steps I may avoid it” but all the steps are fairly easy and don’t require too many ingredients so it’s manageable. The last step before assembling is to combine your cheese mixture. 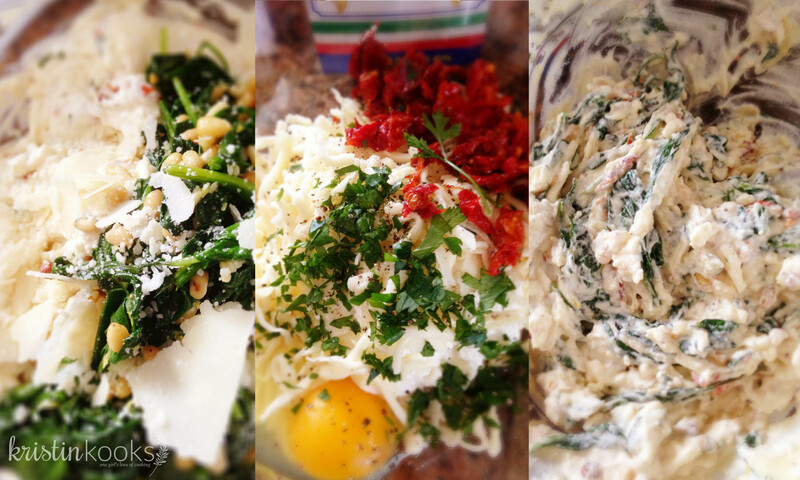 Mix ricotta cheese, 1 cup mozzarella cheese, 1 cup Parmigiano-Reggiano, one egg, sun-dried tomatoes, spinach mixture, parsley and salt and pepper. Time to assemble! First, lay down a layer of sauce and then a layer of noodles. Note: I use Trader Joe’s no-cook lasagna noodles. On top of the noodles, add your cheese mixture, followed by 1/3 of the roasted zucchini. Add another layer of noodles, sauce, cheese mixture, roasted zucchini and so on. 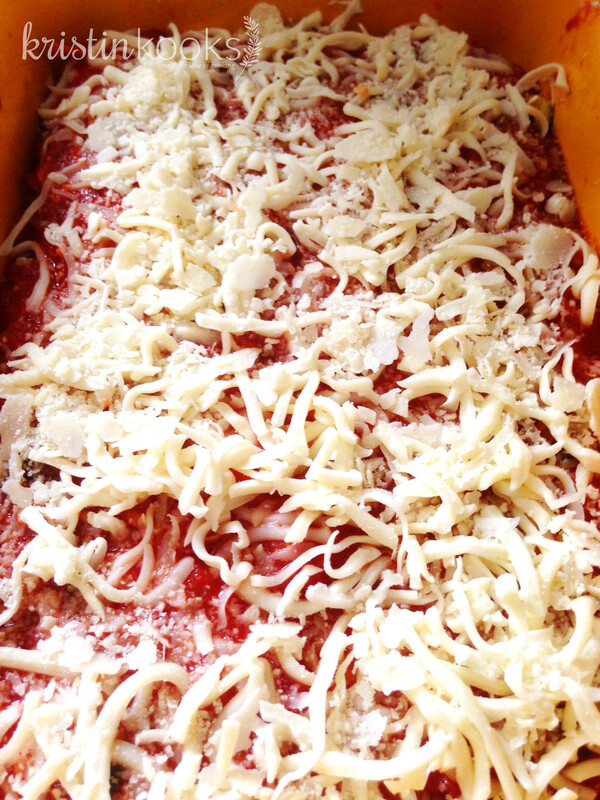 Top the last layer of noodles with tomato sauce, 1 cup of mozzarella and the remaining Parmigiano cheese. Once you have all your layers ready, either pop in the fridge OR cook – it’s up to you. If you put in the fridge to rest, take out about half an hour before cooking to let the lasagna come to room temperature. Cook in a 375 degree oven for 30 minutes covered. Remove foil and cook for another 20-25 minutes or so . . . until the top is slightly brown on the edges, gooey and bubbling. See?? This is why I didn’t take a picture, we were too excited to eat! It turned out super tasty and made for great leftovers. It tasted just as good the second day. Enjoy. Next Cooking with the Italians!